Norwalk, CT – April 20, 2010 – Questions regarding the financial impact of the recently enacted Patient Protection and Affordable Care Act on senior care and living providers will be answered by a panel of distinguished experts in the long-term care and seniors housing field, including business, policy, investment and property value experts. Leaders and teams in the senior care industry and the broader investment community are invited to interact with these experts as they debate the financial impact of health care reform on the long-term care industry, during an interactive conference hosted by The SeniorCare Investor at 1:00 p.m. on Thursday, May 13, 2010. The moderator of the conference, Stephen M. Monroe, Editor of The SeniorCare Investor and The Senior Care Acquisition Report, will pose questions including: What will happen to Medicare reimbursement? And, as a result of the Community Living Assistance Services and Supports (CLASS) Act, legislation that was introduced some time ago but was finally passed as part of the Patient Protection and Affordable Care Act, will senior care facilities, including skilled nursing and assisted living facilities, experience an increase or decrease in occupancy? The publisher of The SeniorCare Investor, Eleanor B. Meredith, invites you to join us by phone to examine the financial impact of the recently enacted Patient Protection and Affordable Care Act and the Community Living Assistance Services and Supports Act on senior care and living providers. This interactive conference is expected to be a lively debate featuring: Rick Matros, Chairman of the Board and CEO of Sun Healthcare Group; Stephen A. Moses, President of the Center for Long-Term Care Reform; and Hedy Rubinger, Partner in Arnall, Golden Gregory LLP. Teams are encouraged to assemble and address this distinguished panel, including Mr. Monroe, with their own questions regarding how the seniors housing and long-term care industry will be affected by The Patient Protection and Affordable Care Act that President Obama signed into law in late March. While the new law is being cheered for leading to certain patient protections and increased access, it is also being criticized for increasing deficits and taxes, and leading to health care rationing. This panel is assembling to examine, simplify and cut through all the political rhetoric surrounding the Patient Protection and Affordable Care Act and the CLASS Act. Other questions up for debate include: Will the health insurance mandates hurt my property (or company) value? Will these additional costs get reflected in my reimbursement rates? How will I deal with the new ownership disclosure requirements? Plus, attendees’ questions will be accepted throughout the conference. Stephen M. Monroe, Editor of The SeniorCare Investor, the leading industry newsletter, and The Senior Care Acquisition Report, an often quoted annual study of acquisition trends in the senior care market, and Executive Editor of Senior Living Business, will open the conference by presenting his own questions. Mr. Monroe has selected a panel of experts representing a range of perspectives on how the newly passed health care reform law will financially impact everyone involved in the long-term care industry, including those who invest in, manage and run the businesses, and the residents themselves. Rick Matros, of Sun Healthcare Group, currently serves on the Executive Committee of the Alliance for Quality Nursing Home Care, a Washington, D.C.-based advocacy group for the long-term health care industry, is on the board of directors of Smile Brands, Inc. and is on the Advisory Committee of Aviv Asset Management, LLC. Stephen A. Moses is widely recognized as an expert and innovator in the field of long-term care and is a co-founder of the Center for Long-Term Care Reform, which is based in Seattle, Washington and promotes universal access to top-quality long-term care by encouraging private financing as an alternative to Medicaid dependency for most Americans. Hedy Rubinger, Partner in the firm Arnall, Golden Gregory LLP, represents health care providers including nursing homes, continuing care retirement communities, hospitals, ambulatory surgery centers, ancillary service providers and physicians in matters related to operations, regulatory compliance, certificate of need, managed care, reimbursement, change of ownership and employment issues, and also represents investors and lenders. She has extensive experience in managing the regulatory aspects of health care transactions, ranging from single-facility purchases to some of the largest multi-state, multiple service-line transactions. The agenda is set for this interactive audio conference to be a fast-paced, informative session providing insight from long-term care industry experts on the anticipated financial impact of the new health care reform law on the senior care industry. The fee to connect, and listen in or get involved in this interactive event, covers an unlimited number of participants at $297 per dial-in site. The cost must be prepaid with a credit card and a CD or transcript will be available and may be added for an additional $100. Registration may be completed online by clicking here or visiting www.seniorcareinvestor.com. For more information or to register by phone, please call 1-800-248-1668. The SeniorCare Investor is published by Irving Levin Associates, Inc., founded in 1948, the leading publisher of newsletters, reports and online data on mergers and acquisitions data in the seniors housing and health care industry. 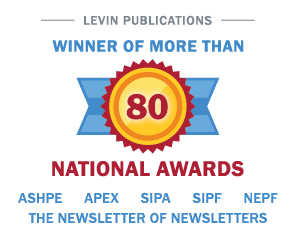 Please visit www.levinassociates.com or call 1-800-248-1668 for information.